After having worked on improving the stability and features of scmdraft 2 for the last couple of months, I think it is a good time to get some feedback on the (minor) changes to the UI, and squish the remaining and any newly introduced bugs. Most of the work went into improving the internal code and structures, but there are some UI changes. This includes a new overlay panel on the left sidebar, a reworked doodad palette, and a new unit palette. Let me know what you think and if it works. Thanks Suicidal Insanity, the best editor out there just became better. SI, if we want to post a bug, or even a suggestion, or anything like that, would you like it to be posted here on TL or on Staredit.net, or PM or email? I personally have a really hard time with SEN (doesn't even send me a verification email even after multiple tries). Here is fine. That's why I made the thread =) Once I'm fairly confident most of the remaining bugs have been found and fixed I'll continue posting it to more sites. -Switching from one map window to another one, preserving the brush that had been selected in that window before switching to another one (or at least having the option to preserve brush). I tend to do a lot of copy/paste work in my melee maps, and I switch windows constantly. Having to go back and select the same brush I was using before can get quite annoying. Example: Was on a space map, using Low Platform brush. Switched to other window to check something, go back to the original window, and Elevated Catwalk was selected instead of Low Platform brush. Very small thing, if it's not too much trouble it would be great! EDIT: After some thought, this might be better as an option more than a default setting. I'm absolutely loving the Tile and Microtile overlays! Although I'm not too sure what some of them are, for example, what is the difference between "Height" and "High Ground"? (EDIT2: Just found out what Height does) And all the "Unknown" or "Deprecated" overlays? Maybe these questions are better answered on SEN, although I cannot even make an account there... Will you be filling these in with more proper names once they are figured out in an upcoming release? Thanks SI! It's looking great so far. I quickly looked through most of the options and features, haven't found anything odd. Not sure if this is intended, but resizing the terrain, unit and doodad windows by dragging the corner/border causes it to move as it is being dragged by the cursor. Looks kinda buggy as it does this, as well. Switching between maps should restore the previous layer + brush settings. Same when switching back and forth between layers. I change a lot of the implementation of how the exact brush contents are stored (I now have a nice "StarcraftBrush" class instead of a bunch of settings), so it looks like that isn't working perfectly. I'll get that fixed soon. I'm fairly sure the game doesn't even load most of the 'deprecated' flags, those are just listed for people who are interested in viewing the info stored in the tileset. 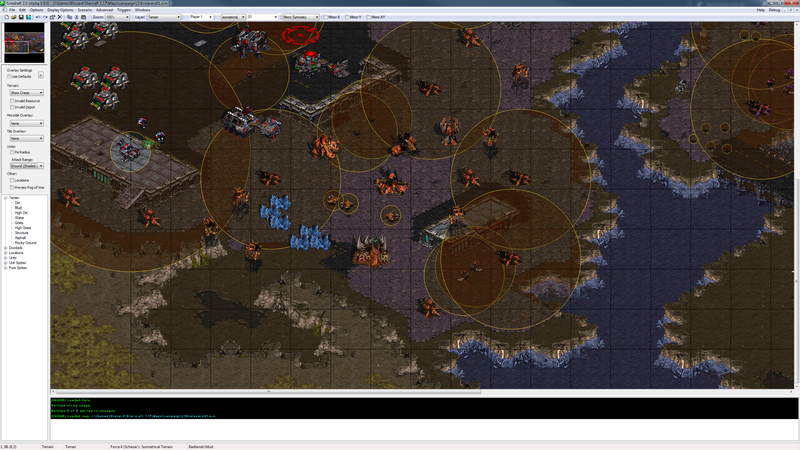 The game regenerates a few pathfinding and fog of war related ones on data load, and overwrites em. If anyone knows what the unknown flags are for I'll add proper names. On May 18 2017 03:33 JungleTerrain wrote:I'm absolutely loving the Tile and Microtile overlays! Although I'm not too sure what some of them are, for example, what is the difference between "Height" and "High Ground"? (EDIT2: Just found out what Height does) And all the "Unknown" or "Deprecated" overlays? Maybe these questions are better answered on SEN, although I cannot even make an account there... Will you be filling these in with more proper names once they are figured out in an upcoming release? Unknown(ramp? 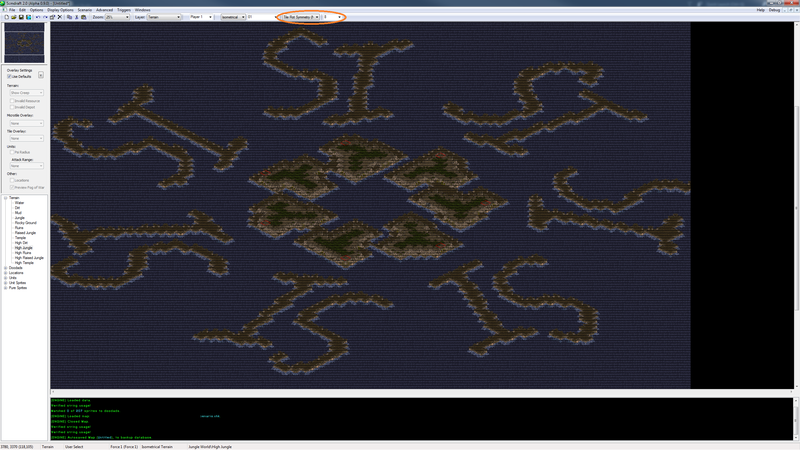 ): ewisott (only ever set on ramp tiles). Which function this has in the game, if any, is not known. Height: Combination of Medium Ground, High Ground and Obscuring flags (see above), so you can see all terrain levels in one overlay (better combination and customization options may be implemented later). Building placability (sic! ): read: buildability... For Installation this currently seems to only show settings of flag 0x8000 instead, which allows for the placement of Beacons and Starting Locations, but not actual buildings. Height: Also not an actual flag but an elevation value the game engine calculates at game start to determine terrain level for vision calculations. 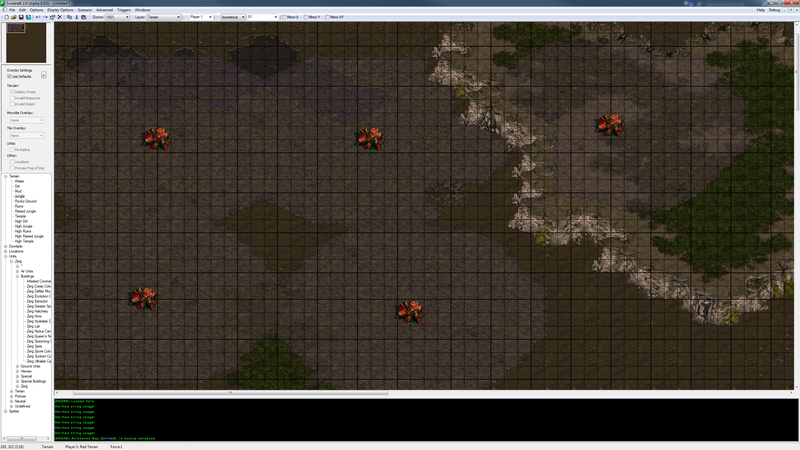 Vision blocking tiles are also included in this overlay, so you could more accurately dub it the vision overlay. The minitile threshold is off by 1 for medium ground in this version, but S.I. will fix that today. Mostly walkable/Not mostly walkable: One being just the inversion of the other; I can't be sure, but I think this is actually not a pre-set flag but information calculated at game-start for pathfinding. Less than 4 unwalkable subtiles is the threshold. Partially walkable: Similar to the above, but assigned to all tiles which are neither fully walkable nor fully unwalkable. Deprecated(0x0001): Seems to have denoted something similar to unbuildability at some point. As the deprecated already suggests, you can safely forget about this one. Deprecated(0x0004): Denotes normal unwalkable terrain types, i.e. cliffs and water-like terrain. Probably no in-game function. Deprecated(0x0100): Indicates doodads with sprites. Used to initialize sprite flags. Does not really yield any useful information. Deprecated(0x0200): Seems to have indicated medium ground at some point, except for Badlands and Ash World terrains. Deprecated(0x0400): Seems to have indicated high ground at some point, except for Badlands and Ash World terrains where it is linked to medium ground instead. Unknown(0x0002), (0x0008), (0x0020), Deprecated(0x0800): These are unused (never set), just ignore them. Pure/Unit/Flipped Sprite (doodad): Used to initialize doodad sprite flags. Pretty much ewisott. The new SC doesn't allow for some colors like black and blueish grey (they appear as some random color like teal or green in game instead of the black assigned). If possible a fix would be much appreciated. Black never was an official color, it just worked to due a buffer overflow in the player color lookup, and always has been patch dependent. StarCraft (since broodwar and up to 1.16) only has 16 colors defined "officially". I never tested if 1.18 still has all 16 - but they still are in the data files for the 8bit graphics. Yeah well I know the blueish gray and a couple numbers that I'v tried including "19" and "20" (diff shades of black) don't work. Hardly a big deal just makes me sad because black was really cool in this one UMS map that I liked to play. Only colours 1..12 (red, blue, teal, purple, orange, brown, white, yellow, green, tan [aka. peach], pale yellow, dark aqua [neutral player colour]) are properly defined, all others are buffer overflows which appear differently, dependent on the tileset and game version. It might be possible to find a black colour under 1.18 (or some other one that looks cool) by just testing the complete byte range. So I wanted to point out what seems to be a UI inconsistency. Image 1 shows that I have the minerals selected, and at the bottom it says "7 units selected." This is correct. Image 2 shows what happens after you place a unit and then try to select any other units. Here I have placed a few marines for Player 1, and then I selected them. 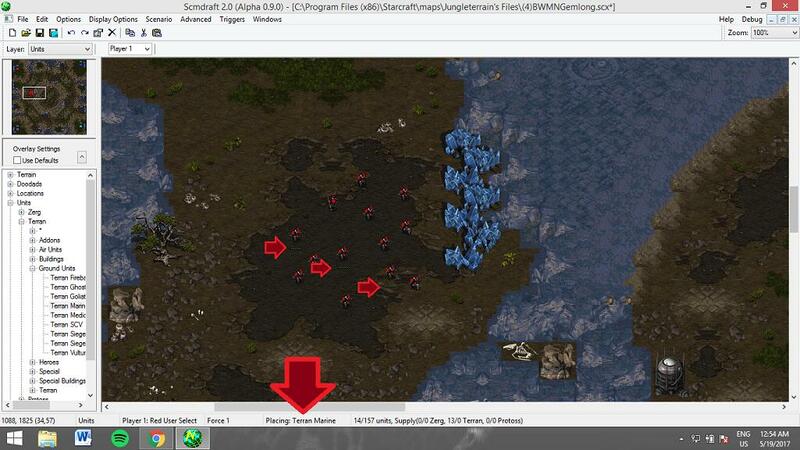 As you can see, the UI at the bottom does not update and still displays "Placing: Terran Marine." SCMDraft 2.0 Beta 0.8.0 in this case would display "# units selected" here. Image 3 shows what happens after you clear the selection. At the bottom, the big arrow is pointing to the fact that it still says "Placing: Terran Marine" even though this is not the case. In 0.8.0 this would just say "No selection." Also, I don't know how big of a deal this is, but the three smaller arrows are pointing to the graphical residue left by the HP bars of the units leftover after clearing the selection. Once you move the camera to another part of the map, these clear. Might not be able to see it on here... I might have to put a zoomed in picture. Not sure if you were aware of these already, but there ya go! Didn't know about the status bar issue, good catch. I knew about the health bar remnants (The good news is: the healthbars now have the correct offset ! ), but I'm sure there are other graphical glitches I don't know about, since I changed quite a bit of the GFX code.